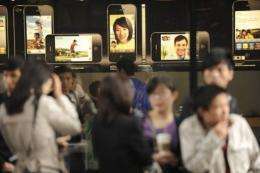 People queue for the launch of the iPhone 4 outside Apple's flagship store in Beijing last September. Apple plans to open its first store in Hong Kong and another in Shanghai by year's end, a spokeswoman says, as the maker of the iconic iPhone sets its sights on the booming China market. Apple plans to open its first store in Hong Kong and another in Shanghai by year's end, a spokeswoman said Tuesday, as the maker of the iconic iPhone sets its sights on the booming China market. The US firm, which already has four stores in mainland China, is aiming to open both new locations before year's end, she said, without confirming dates. Apple products are currently available in Hong Kong through registered dealers or online. Some die-hard fans in China -- which has the world's largest online population with 485 million users -- queue for days to get their hands on the latest Apple products. Apple has said its second quarter revenue in greater China -- an area including Taiwan and Hong Kong -- reached $3.8 billion, six times that seen in the same period last year, making the region a key driver behind the company's record results.